Welcome to part two of my guide to getting your family tree started. This post focuses on English and Welsh records only, but scoot to the end of the post for links for information for Scottish, Irish and US records. Once you’ve gathered all the information you can from questioning your relatives, the next step is to try and locate ‘vital’ records for your ancestors, that is their birth, marriage and death records, and to try and locate them on census records. Finding your ancestors on these two records can help you get much further back on your developing tree branches. First, let’s look at vital records and what they can tell you, and then I’ll explain how to search for records. 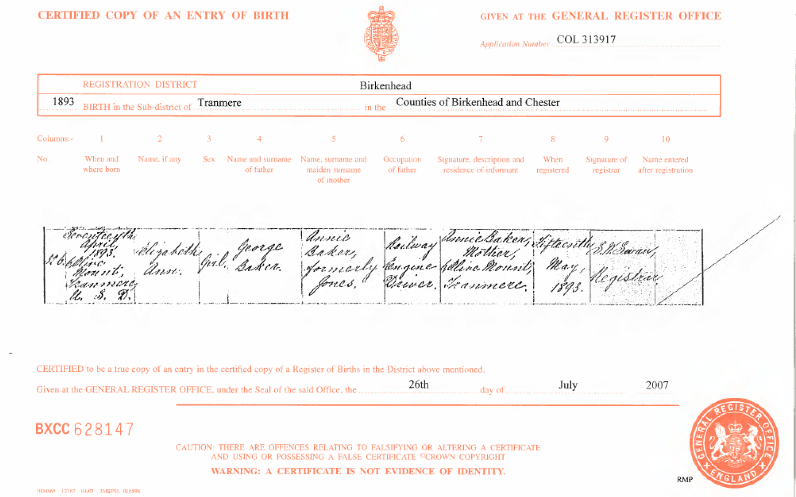 English and Welsh birth certificates tell you where and when an ancestor was born, who their parents were, and the mother’s maiden name (assuming she was married at the time of the birth). They can also indicate whether a mother had been married more than once. If the father’s name section is blank, then you know that the birth of the child was out of wedlock. Sometimes, in the case of children born illegitimate, the birth index certificate can give a clue as to the identity of the father. In particular look at any middle names given to the child. For example, one name in my extended family tree is George Pope Winterbourne, born to one of my direct ancestors, Elizabeth Winterbourne before her marriage. Sure enough on the 1841 census, I found her living at a boarding house with one George Pope and their young baby George. 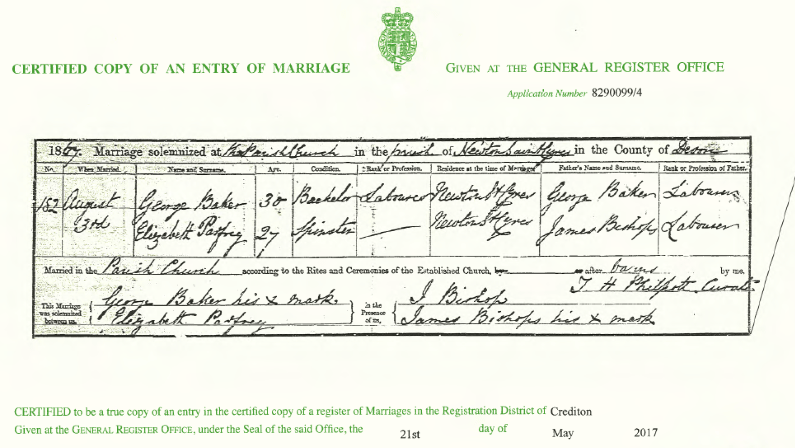 Marriage certificates not only tell you the names of those being married and the date of marriage, but also give an idea of the ages of the bride and groom; sometimes with an exact age, or they will state ‘full age’ (over 21), or ‘minor’ (under 21). Also included are the names of the fathers of both the bride and groom, together with their occupation; the certificate will also usually state whether the father is deceased at the time of the marriage. Other clues a marriage certificate gives is whether either party has been married before, and the names of those witnessing the marriage; this has been very helpful to me in the past to find names of siblings to confirm I was looking at the right family on census records where the names were relatively common. These certificates also feature the signatures of your ancestors and the witnesses. If you see an ‘x’ with a notation of his or her mark, that is an indication that your ancestor was not able to write, as in the example below. Death certificates include less useful information for the genealogist, but are still useful. Not only do they confirm the date and cause of death of a person, they give age at death information, (with certificates after 1 April 1969 showing the date of birth as well) and details of the informant. Often this will be a close family member such as a wife, husband, or child of the deceased. This can be useful if you are struggling to identify a person, particularly where the informant is a married daughter to the deceased and you weren’t able to confirm their married name previously. 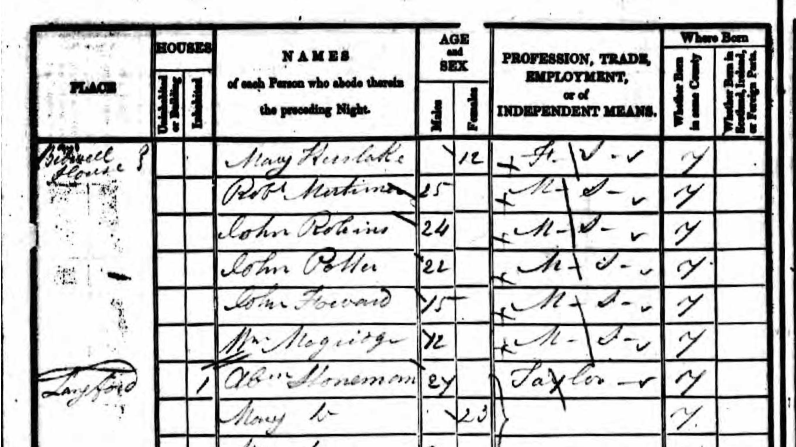 Census records are the other place you definitely want to try and look for your ancestors, since they give a picture of who was resident in the household on the night of the census, their approximate age, birth location, occupation and their marital status. 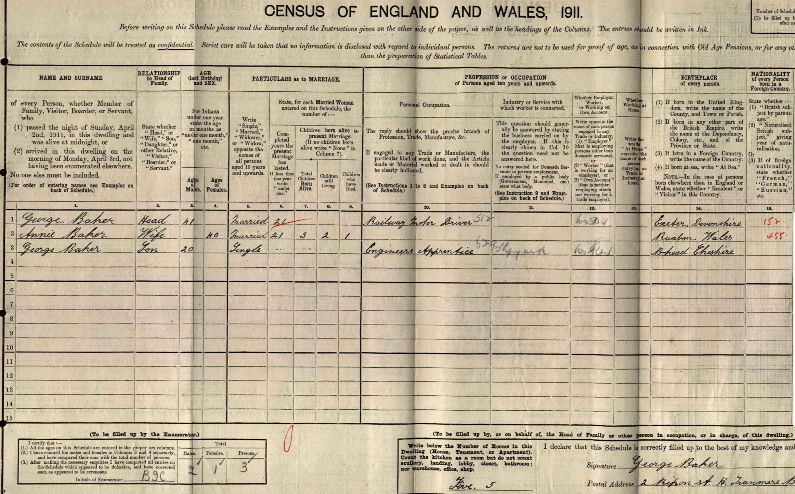 Again, this post focusses on English and Welsh records (although the 1841 to 1911 censuses also cover the Isle of Man and the Channel Islands). My suggestion is that you try and find the head of the family first, but if that doesn’t enable you to find the right record, try searching other names that you think may be resident in the family. If you aren’t sure, my GRO indexes search trip can help give you an idea of who the children in a family might be (see below!). The easiest way to find all relevant records is to start at the latest census and work your way back, decade by decade. Do note, the age given on censuses is not always accurate; people either gave their best guess or claimed to be younger than they actually were (or occasionally older). I’ve also noticed quite a lot of discrepancy in stated birth locations. Also note that transcriptions are not always accurate, so it’s worth searching across different sites if you are struggling to find your ancestors on one site. A special note regarding Find My Past; if you are struggling to find your ancestors, Find My Past has an address search function on all its census indexes; you can also use keyword searches on Ancestry, although I have found this less effective. This is the currently the most recent ‘proper’ census available to us. It not only gives us the expected census information of names and ages of all those resident in the household on the night of the census, occupations and where they were born, but gives the size of the residence (which can be a bit of an eye opener, I will never again complain about my one bedroom flat being too small for me! ), how long couples have been married, details of children born to the marriage, and how many were still living at the date of the census. Rather morbid to us in the modern age, but this can be crucial information for the family historian; it can tell us how many children we should be aiming to find in the birth and death indexes, and when a marriage should have taken place to try and find that in the indexes. In addition, the size of the residence, whether the householder physically wrote the record, and the number of living children can also be a very good indication as to the poverty level of your ancestors. For example, a family of seven living in two rooms with a record of three of eight children having died is a good indication of a family living in or close to poverty, whereas a family living in four or five rooms with fewer children all of whom are living is a good indication that the family were better off, and likely literate if the form is written in the same handwriting as the signature. These censuses are all in the same format, giving us residents, ages, marital status, occupations and where born. These can sometimes help work out where to look in the birth indexes to find a birth record where you are struggling with a common name, and similarly, if a daughter disappears off the census records, it may be an indication that she has either married, or perhaps gone into service (or in the case of one of my ancestors, she disappeared because she had emigrated to Australia, apparently all by herself!). The 1841 census differs from the later censuses as it has far less information. That doesn’t mean it isn’t useful however. You can confirm those living at an address, their occupation, whether they were born in the country where they are resident at the time of the census and their approximate ages. In the case of the ages, do note that this was usually rounded down to the nearest 5 years (although not always). 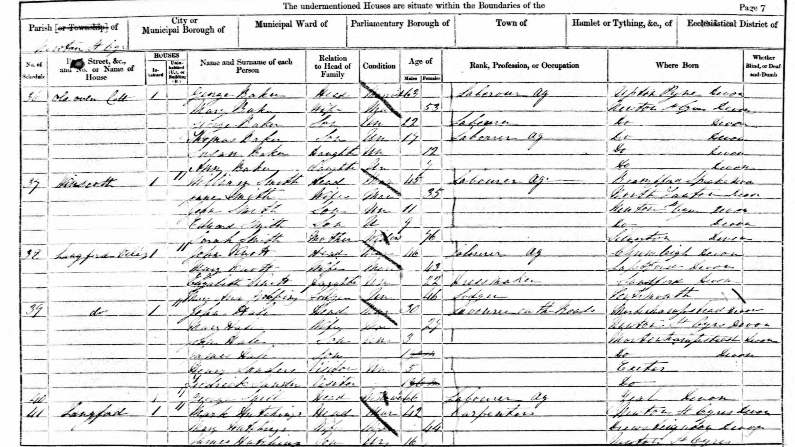 If you do manage to find your ancestors on this census, it sometimes gives you enough clues to enable you to find parish records for ancestors born earlier than 1837. Note there are some gaps in the 1841 census records, for further details see this helpful page at Find My Past. Whilst not technically a census, I’m including it in this section, as the information it contains is very like the earlier censuses, and particularly useful as it is the most recent national record of this type that we have access to. It contains details of all civilians in Great Britain and Northern Ireland, and includes names, occupations and dates of birth for all those resident in a household. It does not include military personnel, nor those born less than 100 years ago unless they died prior to 1991. You can search for your ancestors using free databases, or paid ones, and my previous post gives you some of my favourite tools for searching. Whether the records you need are accessible online will depend upon the geographic location you need to look for, and what time period you are looking in. Even the subscription sites offer the ability to search for free so you can get a good indication as to what records are available for your ancestor before you pay up for a full subscription. If you are planning to go ahead and DNA test (although this guide works whether you are or not), I strongly recommend building your tree in the place where you are planning to test, since this means you can link your DNA results to yourself in the tree, which will help enormously in working out how you connect to matches (and in the case of Ancestry, allow them to do it for you without you lifting a finger in some cases). With Ancestry and My Heritage, it also means that the site will do some of the heavy research lifting for you, showing you matches it thinks are to your ancestor. Whichever site you use to conduct your research, I strongly recommend saving any records you find to your computer or saving them somewhere you can access them again, should you need to; at the very least keep a record of all details in a Word or Excel document, or in a notebook you use for genealogy if you prefer paper and pen. Google Docs is a great solution for those who want something accessible from the cloud. This is because most of the genealogy sites do not allow you to view records again if you cancel the subscription. Also, add to your developing tree as you find new information. If you are using software such as Ancestry’s or My Heritage (or indeed any other web or software based family tree solution), you can usually export your tree in a universal format known as a ‘GEDCOM’, which will allow you to use your tree with any genealogy software. You can find more information about the GEDCOM format and GEDCOM viewers at Cyndi’s list. Technology is marvellous. The ability of Ancestry and My Heritage to immediately lead you to your ancestor’s records despite you providing minimal information is incredible and still astounds me. However, this technology is a major downfall at the same time. A lot of Ancestry users take the ‘shaky leaf’ hints at face value and treat them as gospel without verifying that the records are correct for their ancestor. If enough people repeat the error it looks true without actually being so. For that reason, be very careful to check the hints suggested to you, and for your own tree, do not add information from public member tree hints unless you are 100% certain they are correct. Public member trees can be helpful to point you in the right direction, but never trust them unless you can verify the information independently. If you are searching for a birth in England or Wales pre 1917 then I am going to highly recommend that you jump straight to the GRO indexes, where you can currently search Births from 1837 to 1917 for free, and deaths 1837 to 1957 for free; not only that but you can order the certificate as a PDF or hard copy as well. The reason I like this search is that you can search for your known ancestors birth, and once you’ve found the record, the free search will show you not just the details to enable you to easily order the certificate or pdf should you wish to, but it will also show you mother’s maiden name (or usually a ‘-‘ if the mother was unmarried at the time of her child’s birth). If you don’t know the maiden name, this is a godsend. If you do know the maiden name but you are searching for the birth of a John Smith, this can also be a godsend! Don’t order English and Welsh vital records anywhere but through the GRO or the local records office for where the event took place; I noticed that Ancestry in particular charges a pretty large mark up if you order through them. My usual starting point for worldwide records is Ancestry because usually my research locations are the UK, the US, Australia and New Zealand. I’ve also used it for Canada with less successful results. For Scottish results, I also try Ancestry, but more usually I head straight to Scotlands People. Northern Ireland Vital Records over 100 years old can be searched online at https://geni.nidirect.gov.uk. Only the 1901 and 1911 censuses for Ireland survive, a fire at the building housing the Public Records office in 1922 having destroyed the earlier censuses. However, both the surviving censuses are free to search and view at http://www.census.nationalarchives.ie/search/. Other useful Irish records may be found at PRONI and https://www.irishgenealogy.ie/en/. 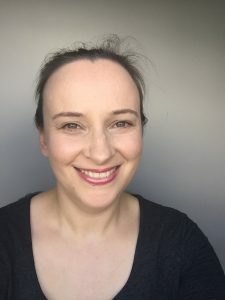 My first port of call for searching for US records is Ancestry, but I also use FamilySearch regularly as well, which is free to use, although you do now have to register to use it. FamilySearch has some vital records which Ancestry doesn’t have, or sometimes the images where Ancestry only has the index. I do things slightly differently when I research US records, which is to look for census records before I search for vital records. 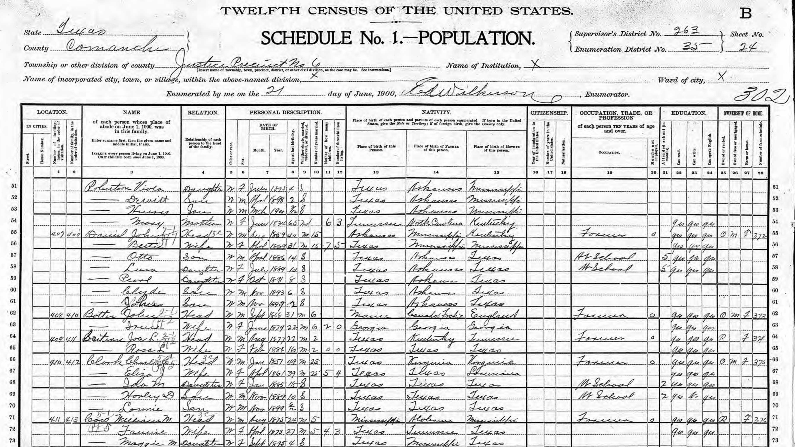 This is because there is more recent census data available for the US (up to 1940), and also because not all vital records are online; the availability of vital records for the US depends very much on what state your ancestor was born in (and before a certain point whether births were even registered). This page at FamilySearch can help you find what you need to know for specific states: https://www.familysearch.org/wiki/en/How_to_Find_United_States_Birth_Records. I refer to it frequently. For census records, I always search at Ancestry first, usually just the name, a location if I have one, and an approximate year of birth with a wide +/- margin. 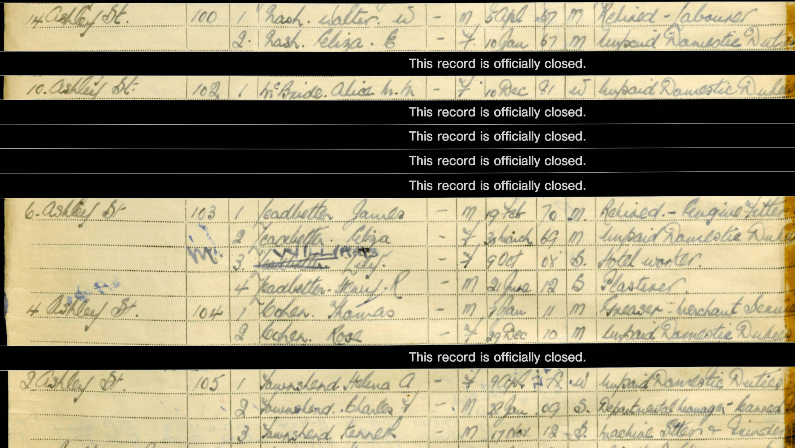 It’s also worth leaving the search parameters as all results as there may be other useful documents for your ancestor such as World War I or II draft cards, or yearbook records, etc. Note, do not be surprised when you can’t find your ancestors in the 1890 census; most of it was destroyed in a 1921 fire and only fragments survived. That’s it! Let me know if you have any questions, or if you’d like some more information relating to a particular location.